1. What brought you to Auburn and to major in engineering? I grew up wanting to study engineering at Auburn because my father, John, is an Auburn engineer (E.E. '82). When I was in middle school, I became fascinated with computers and programming. I taught myself to code, and I was obsessed with any computer I could get my hands on. When it came time to apply for college, I decided I wanted to study software engineering. At the time, Auburn was one of the few schools in the Southeast that offered that degree, so it was an easy choice. 2. What path led you to California, working for Twitter? While at Auburn, I had multiple classes where we studied mobile software. I enjoyed the topic so much that I worked as a research assistant on two mobile projects, and I eventually went on to write my Masters thesis on the topic. After graduation, I moved to Washington, D.C., to work for a mobile startup. I found the fast pace and wide variety of responsibilities required of a startup employee created an environment where I thrived. A few years later, I received an opportunity to work for another mobile startup based in London. While in that role, I found myself frequently traveling out to California, and I really enjoyed spending time there. I had friends in San Francisco, so I decided to move out and give it a try. 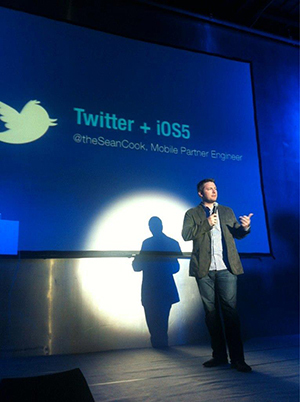 Shortly after moving, I found an up-and-coming startup, Twitter, was hiring for its newly-created mobile team. It was a small, scrappy company at the time, and after talking to the founders and a few of the employees I knew right away it was where I wanted to work. 3. How did your Auburn engineering education prepare you for what you are doing now? My Auburn engineering education gave me a solid engineering foundation while also providing me with the ability to focus on my passion, mobile software. I was fortunate enough to have great professors who fostered my love for mobile by inviting me to work on research projects in the subject. I also participated in the Co-op Program, where I worked for BellSouth in Birmingham. By the time I graduated, I had multiple years' worth of experience in my chosen field as well as multiple job offers. 4. What advice would you give young engineering alumni from Auburn? Remember: "I believe in work, hard work". The companies that become household names were not built by lazy people, they were created by hard-working people with a passion for what they created. 5. Do you have a favorite Auburn memory or War Eagle moment? The winning field goal of the 2010 BCS National Championship. As a life-long Auburn fan, I will never forget that feeling.